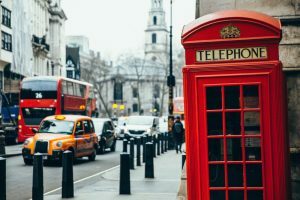 Find out how to use your cellphone in the UK if you’re visiting or moving to the United Kingdom. Whether you’re visiting the UK on a short-term trip, or moving there longer-term for study or for work, it’s easy to use your existing cell phone on the cellular networks within the United Kingdom. 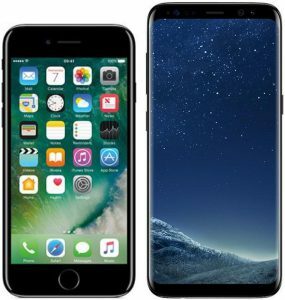 In this article, we’ll discuss cell phone compatibility on UK cellular mobile networks. We’ll also compare the two different ways of using your phone in the UK: roaming on your domestic SIM card or getting a local SIM card in the UK. Finally, we’ll compare the best value pre-paid SIM cards for both visitors and for people moving to the UK. In the UK, there are four cellular coverage providers: EE, O2, Three & Vodafone. Between them, the four providers each cover about 99% of the UK using GSM (2G), WCDMA (3G) and LTE (4G) technologies. There are also a number of MVNOs (virtual network operators) that piggyback on coverage from one of cellular coverage providers. * Both O2 and Vodafone also have some limited coverage on GSM 1800 and WCDMA 900 (available in selected areas only). In order for your phone to work in the UK, it will need to support at least one of the above frequencies. Most modern cellphones should at least support 2G and 3G in the UK (with the exception of CDMA-only handsets). Some will also support 4G coverage in the UK (but this will depend on the model of your handset and where you purchased it). If you’re unsure about the bands/frequencies supported by your cellphone, you should consult your handset manufacturer’s documentation. There are two ways to use your cellphone in the UK: you can either roam on your domestic SIM card or you can pick up a local SIM card from one of the UK mobile networks. If you’re only visiting for a short amount of time & only want to make occasional phone calls or text messages, roaming on your domestic SIM card may be the best value option. In advance of travelling to the UK, you should check with your cellular provider on the costs of using your phone in the UK. You should also ensure that international roaming is enabled on your account (sometimes, you may need to ask for it to be switched on). If you’re planning to stay in the UK for a little bit longer or if you full access to the mobile internet when you’re travelling around the country, it may be worthwhile getting a local UK SIM card. This will probably be more convenient and cheaper than roaming on your domestic SIM card. In the UK, prices start from about £10 for one month’s usage on a local SIM card (this will also cover any usage in other European countries). You’ll get a UK-based phone number (beginning with +44). In the UK, it’s a straightforward process to pick up a pre-paid SIM card. All you need to do is to order a free SIM card online, or you can pick one up in person for a minimal cost. There’s no need for you to be a UK resident and there’s also no need to provide any ID when ordering your SIM card. Your cellphone will however need to be carrier-unlocked for it to accept a SIM card from UK networks. At present, we’d strongly recommend giffgaff as the best SIM card for anyone visiting or moving to the UK. The reason for this is because they provide free international delivery and because they also allow you to top-up with a non-UK credit card or debit card (most other networks will require you to use a UK-based card). Free international delivery & top-up using international credit/debit cards. Our recommended pre-paid network for anyone visiting or moving to the UK is giffgaff. 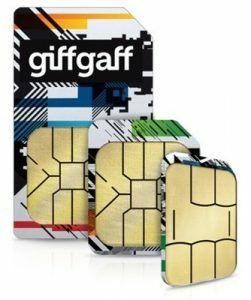 One of the UK’s most popular cellular network brands, giffgaff is unique in offering free international SIM card delivery. This means you can have a SIM card on your doorstep before you even leave for the airport. giffgaff also allows you to top-up with an international credit or debit card (most other networks currently require you to have a UK-based credit or debit card). On giffgaff, a £10 top-up will give you 3GB of 4G data along with unlimited UK minutes and unlimited UK texts. You can also get low-cost international phone calls from the UK to other countries and you can tether at no extra charge (so your mobile internet connection can be shared with other people or other devices). You’ll also get unlimited free calling to other giffgaff members and you can use the SIM card in Europe at no extra cost. For customers wanting a larger allowance of data, giffgaff charges £12 for 4GB, £15 for 8GB, £20 for 20GB and £25 for Always-On data. giffgaff uses O2 as a network coverage provider so will work on any handset supporting GSM 900, WCDMA 2100 or LTE band 20. If you’re not able to order a SIM card from giffgaff in advance, you can also pick up a SIM card in-person when you arrive in the UK. If possible, I’d strongly advise against getting a SIM card at the airport (e.g. at Heathrow or Gatwick). This is because SIM cards at the airport are grossly overpriced. Instead, wait until you get into town and make a visit to the nearest cell phone store, grocery store or gas station (mobile phone shop, supermarket or petrol station in the local lingo). If you’re buying a SIM card in-person, you should expect to pay about £1 for the SIM card plus £10 for the initial top-up. Our guide to Pay As You Go SIM cards will give you a full overview of the available options. As a word of warning, it’s worth noting that most UK networks will not allow you to top-up remotely using a card registered outside the UK. Therefore, unless you’re on giffgaff or another network that specifically supports international top-ups, the only way for you to top-up will be in-person at locations showing the green ‘top-up’ logo (shown on the right). At the end of your trip to the UK, it’s worth holding on to your SIM card. 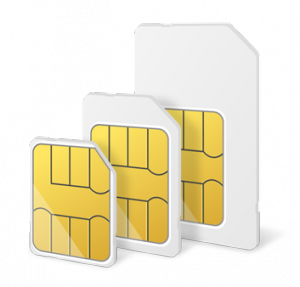 Typically, your pre-paid SIM card will remain active for about 6 months after the last usage of your SIM card. 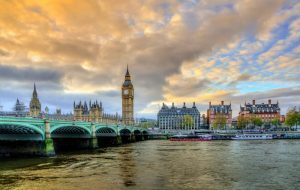 Therefore, if you’re planning to visit the UK again on a future trip (as we hope you will! ), you may be able to re-use your SIM card on that occasion. Note on Pay Monthly deals: If you’re moving permanently to the UK, you may be tempted to get a Pay Monthly SIM card on contract. In order to get a Pay Monthly contract, you’ll need to be a UK resident and you’ll need to undergo a UK credit check. You’ll also need a UK bank account against which your Direct Debit payments can be made. Unless you’ve lived in the UK for a certain amount of time, we’d always recommend getting a pre-paid deal like giffgaff which requires no credit check. 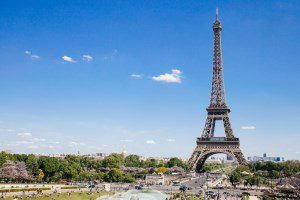 If you’re combining your trip to the UK with a trip to mainland Europe, you can continue to use your pre-paid SIM card there at no additional cost. There is no need to get a separate SIM card in each country you’re visiting, particularly with the advent of Roam Like Home legislation. You can use your UK SIM card at no extra cost when travelling to one of the following EU countries: Austria, Belgium, Bulgaria, Croatia, Cyprus, Czech Republic, Denmark, Estonia, Finland, France, Germany, Gibraltar, Greece, Hungary, Iceland, Israel, Italy (includes Sardinia and Sicily), Latvia, Liechtenstein, Lithuania, Luxembourg, Malta, Netherlands, Norway, Poland, Portugal (includes Azores and Madeira), Republic of Ireland, Romania, Slovakia, Slovenia, Spain (includes Canary Islands and Balearic Islands) and Sweden. Likewise, if you already have a SIM card from one of these EU countries, you should be able to use it in the UK at no extra charge. If you’re travelling to Guernsey, the Isle of Man, Jersey, Monaco or Switzerland, you should read the article here for information on whether it’s covered by your network. Some networks also go beyond roaming in Europe. For instance, a pre-paid SIM card from Three in the UK can also be used at no extra cost in countries like the USA, Australia, Brazil, Singapore and more. In the UK, cellphones are known as ‘mobile phones’. Cellphones are typically referred to as ‘mobile phones’ in day-to-day usage. Carriers or cellular networks are more commonly referred to as ‘mobile networks’ in the UK (or ‘mobile phone networks’ to give them their full name). Instead of re-filling or re-charging your prepaid plan, we typically just refer to topping-up your Pay As You Go account. When shopping or comparing price plans, it’s also worth being aware that prices in the UK already include VAT (sales tax). If you’re using a UK SIM card, you’ll be assigned a new UK-based phone number on the SIM card. The phone number will be 11-digits long and will start with 07 (e.g. 07123 456 789). If your friends or family would like to call you from outside the UK, you’ll need to replace the zero at the start with +44 to get your international number (so, for instance, 07123 456 789 would become +44 7123 456 789). Similarly, if you’re calling abroad from your UK phone number, you should add the relevant international calling code before dialling out to that number. In the UK, the emergency services phone number is 999. This is a single phone number for all emergency services including the police, ambulance and fire services. The pan-European emergency number (112) should also work when you’re in the UK. If you’re looking to get connected to the internet without using your cellular data connection, many locations now offer free wi-fi (including coffee shops, grocery stores, train station and more). The main providers are BT Wi-Fi, O2 Wi-Fi and The Cloud (there’s more information here on how to get connected). For getting around, it’s worth being aware of the Transport for London (TfL) and National Rail Enquiries websites. They’re both invaluable for providing you with information on how to get around the UK (TfL covers public transport in London whilst National Rail Enquiries covers rail travel across the UK). You can also use Google Maps for transit directions, as well as CityMapper in major urban areas. We hope you have a fantastic time in the UK and a very enjoyable trip! We'd love to hear your thoughts and any questions you may have. So far, we've received 314 comments from readers. You can add your own comment here. How far in advance of travel do you recommend purchasing a sim card? It’s really up to you! If you’re ordering a SIM card from giffgaff, it’s absolutely fine to do this several months before you travel (you would just activate it upon your arrival in the UK). There is a bug on giffgaff’s website which means you can’t always enter a US address. The best workaround is to visit giffgaff.com in your web browser and to order a SIM card from there which should hopefully work. Thank you for your very useful information. Your response to those questions are also helpful. You answered my questions which were posted by others.